Balrogs originated as part of the Thought of Ilúvatar: they were Maiar of the service of Melkor, mightiest of the Ainur. They took the form of a spirit of fire, and after their corruption by Melkor, were to Elves and Men seen as demonic beings of great size. They were enshrouded in fire, cloaked in darkness, with their primary weapon being a whip of many thongs. They were immune to the powers of ordinary weapons; therefore, only the Eldar had any chance of withstanding their power. The Lord of the Balrogs, Gothmog, was slain by Ecthelion, Captain of Gondolin, during the final stages of the sack of the city. 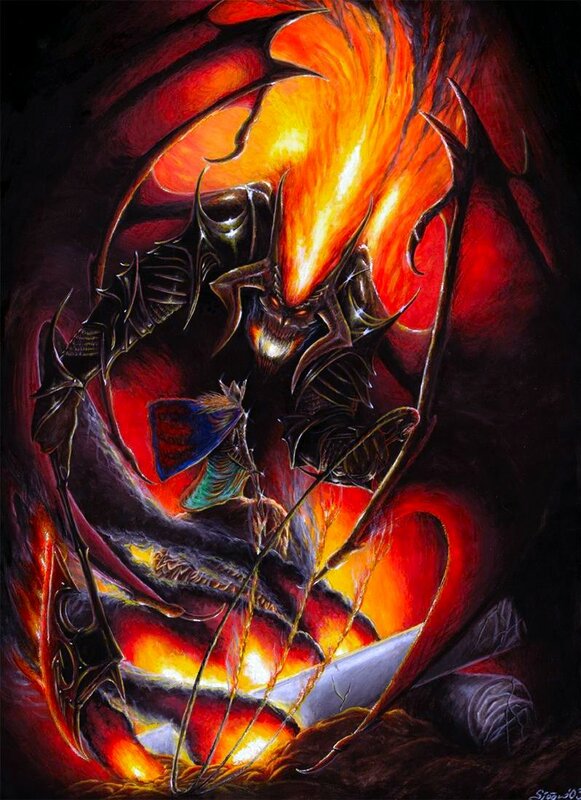 During the War of the Jewels, Balrogs were present in all major attacks, but were nearly all destroyed in the fall of Angband during the Great Battle. At least one is known to have survived, fleeing to roots of the mountains. However, in TA 1980, the Dwarves of Moria, who had been delving deep under the mountain of Caradhras in search of gold, accidently released the Balrog, which then slew two of their Kings, Durin VI and his son Náin I. (This Balrog was later known as Durin’s Bane and the Terror). The Dwarves fled from Moria, and never returned during the Third Age; in 2480, Sauron populated Khazad-dûm with Orcs and trolls, over which the Balrog ruled by way of terror. Following a ten-day battle, the Balrog was destroyed in TA 3019 by Gandalf. Foster, R. (2001). Balrogs. In The complete guide to middle-earth: from the hobbit through the lord of the rings and beyond. New York: Del Rey. Tyler, J. (1976). Balrog. In The complete Tolkien companion. New York: St. Martin’s Press. Want to Play an Elf in ‘The Hobbit’?